The 29.41 metre motor yacht Legenda, jointly listed for sale by Gaspard Yachts and Dbeere Yachts, has had a further €191,000 price drop. Built in GRP by UK yard Princess Yachts to a design by Bernard Olesinski, Legenda was delivered in 2009 as a Princess 95 model. The elegant interior has been fitted out with oak joinery and wenge flooring running throughout the saloon, dinette, galley and lower helm area. Opulent accommodation is for eight guests in four cabins including a full beam master suite, a VIP suite, a double and a twin, all with en suite bathroom facilities. There is separate crew accommodation for four. Twin 1,825hp Caterpillar engines give her a cruising speed of 12 knots and she has a host of factory extras. These include a GRP hardtop, TRAC Star digital fin stabilizers, a Jacuzzi bath in the owner's stateroom, Bang & Olufsen and Linn & Loewe audio visual upgrades throughout, additional engine room sound proofing and an aft cockpit bar. 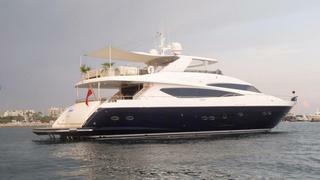 Lying in Cannes, France, Legenda is down from €3,190,000 to €2,999,000. See full details, specs and a photo gallery of superyacht Legenda for sale.